As a Christian, I was extremely hesitant to believe about the Gettysburg “ghosts.” In fact, I was rather closed minded. At first I refused the actual possibility the soldiers of the Civil War past could still be present in spirit form. I was afraid I was opening the door for witchcraft and other demonic activity. Yet while doing research for my first book, “The Blessings of Liberty,” I was sent to the Gettysburg Battlefields. It was there, in the dead of winter, that I climbed Big Round Top. I unexpectedly found paranormal life that had been born out of horrific historical events. The soldiers called to me and I answered them. It really is that simple. “This Fair and Blighted Land” begins the story of Summer Ray Sherwood; Kathryn Black; Union Colonel/General Michael Moses McDaniels; Union Lt. Colonel George Jameson and the Gettysburg Union and Confederate Unknown Soldiers. In this series, the present collides with the past; the past collides with the future. The real life historical characters such as General George Washington; President Abraham Lincoln; General Robert E. Lee; Martin Luther King Jr.; Rosa Parks and real historical events create the historical soundness. 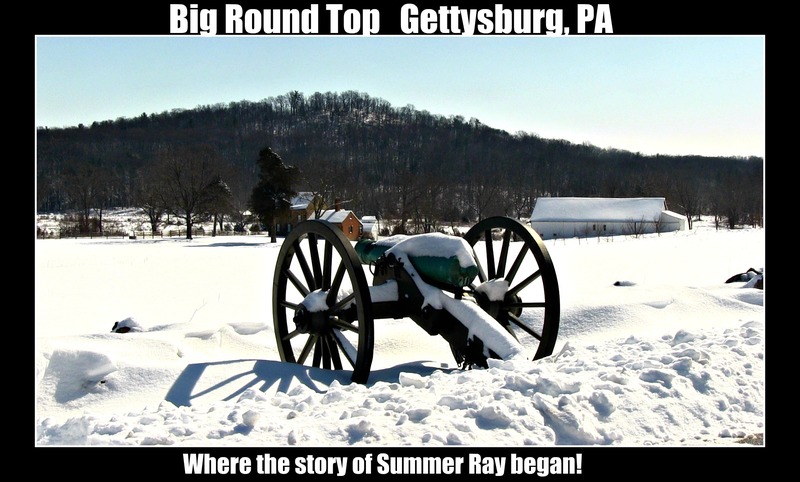 Set in Summer Ray’s beloved Gettysburg, PA the story twists and turns to New York City; New Freedom, PA; Frederick, MD; and Harrisburg, PA. Back and forth the story goes as it intertwines yesterday and today in one compelling epic adventure. Savannah’s Calling finds Summer Ray and Kat heading south to Savannah, GA. But before they travel, an unexpected visitor shows up in Gettysburg. This book, also takes a deeper look into the sufferings of the Civil War soldiers and the reality of the paranormal that most definitely surrounds these battlefields. Once driving on 95 South, stops along the way include; Jamestown, VA – The Birthplace of America; Charleston, S.C. – St. Michael’s Church where both General George Washington and General Robert E. Lee worshiped; the famous Bonaventure Cemetery in Savannah, GA; as well as another journey back in time for Summer Ray and Kat as they try to find the missing pieces of Summer Ray’s past. The ghosts they encounter are indeed no match for Madeline, the fire witch. The General McDaniels is not about to let Summer Ray fight her alone. Yet, at what cost? Back in her beloved Gettysburg, Summer is desperate for a resolution. With new family members, historical non fictional and fictional characters such as Tony Trousdale, along with other Civil War Battlefields to explore, Summer reaches a new level of faith. The clock is ticking and the questions remain. Will Summer Ray aka Anastasia make it in time? With a heart wrenching decision to be made during Kat’s darkest hour, who will Summer choose? Will her new born “Southern Pride” finally overrule her Yankee heart? Or are her northern roots and her love of Gettysburg just too deep? Summer Ray and Kat Black have had some amazing events take place. They have traveled thousands of miles North to South and back to North again. They have time traveled through centuries of space and have learned many valuable lessons about present day life along the way. The General Michael Moses McDaniels still trapped and deteriorating in the marshlands of Savannah, found love, even in the loss of his own hope of rescue. Does Summer Ray give up on her own quest for love? Or do unexpected dreams finally come true. Is Sam, “the one?” Or does Summer’s heart beat for the ghost in chains? Is this really the end? Did Kat make it out of surgery? So many unanswered questions. “Time… Begins Again” is Volume 5 of the Summer Ray Series. With its surprise ending, added new characters joining with the past and present ones, new places to explore, as Summer Ray is once again racing against the one thing there doesn’t seem to be enough of…time. This book will have you laughing and crying as the truth of the past and present is finally revealed. Throughout the series, things have never been as they appeared. “Time…Beings Again” is the ending of Summer and Kat’s epic adventures, or is it? Will The Gatekeepers Log, remain a mystery? Time…will only tell!! !